York County, extreme southwestern Maine, U.S. It is located in a coastal region bordered by New Hampshire to the west and southwest (that border largely defined by the Salmon Falls and Piscataqua rivers), the Atlantic Ocean to the east, and the Ossipee and Saco rivers to the north. Maine and New Hampshire share the Isles of Shoals, a group of islands about 7 miles (11 km) offshore that flourished as centres of fishing and trade in the early 18th century. Timber primarily consists of white and red pine, with some maple and birch. Numerous sand beaches line the coast, including Ferry Beach State Park. Created in November 1652, York is the oldest county in Maine. It was named for James, duke of York and Albany (later King James II). Kittery (settled 1623, incorporated 1647) is Maine's first town; it developed as a centre of shipbuilding. Settled in the early 17th century, South Berwick, York, and Kennebunkport later became popular summer resorts. European settlers clashed with the Indians from the 1670s until about 1710. The twin towns of Biddeford and Saco formed Maine's first industrial centre. Built in the early 18th century, Fort McClary in Kittery Point was remodeled in 1808, 1844, and 1864. 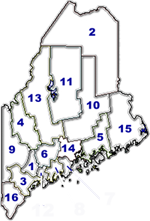 Other communities include Kennebunk, Sanford, and Alfred, the county seat. The economy is based on the manufacture of electronic and transportation equipment, leather, rubber, and firearms. Area 991 square miles (2,567 square km). Pop. (1990) 164,587; (1996 est.) 171,482.